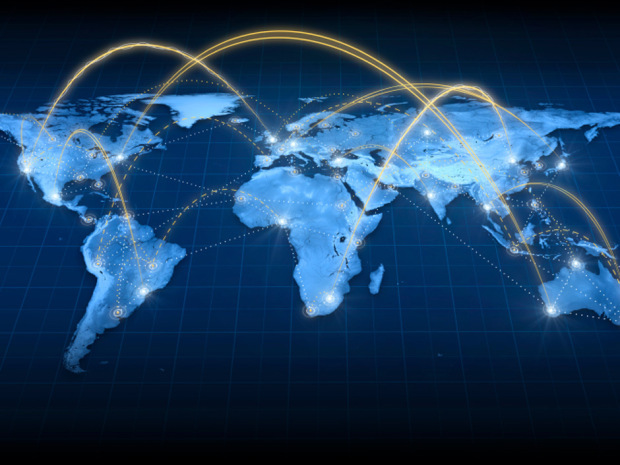 Globalization is often demonized, and there are certainly downsides which have been either glossed over or ignored in these posts. Perhaps I’ll come back to those in a later post, but the reason I’ve focused on the positives is because there are so many that are often taken for granted. The biggest positive, by far, is the era of unrivaled peace we are now living in. Certainly don’t take the newspaper’s word for it, because there are always conflicts somewhere around the world, and as they say, “If it bleeds, it leads.” War still happens of course and with predictably tragic outcomes. However, deaths from war (as a percentage of worldwide deaths) are at their lowest point in human history and prehistory. For those of you who believe in the myth of peaceful pre-civilization peoples, fossil evidence shows the deaths of ancestral men from intergroup violence at a rate as high as 20-30%. 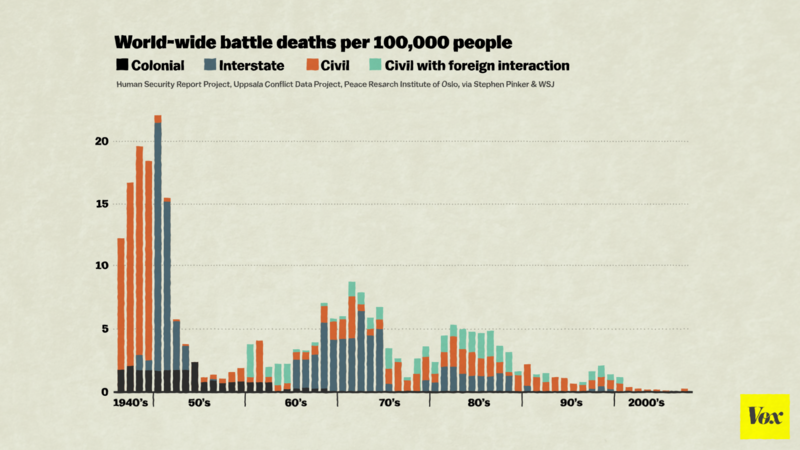 In comparison, deaths from warfare only account for a few hundredths of a percent in today’s world. In 2005, the worldwide rate of death from war, terrorism, genocide, killings by warlords and militias was three hundredths of one percent (source: The Moral Arc, Michael Shermer). Don’t let narrative get in the way of facts, because the facts are quite clear. We’ve never lived in such a peaceful era as a species. Even the 20th century, which by all means seemed catastrophic with two terribly deadly World Wars was peaceful in comparison to every other century that preceded it. Why was it so peaceful? Simply put, the “Trifecta of Peace.” Democracy, economic interdependence, and membership in intergovernmental organizations each make conflict less likely, especially when paired together. The concept behind each of the “Trifecta” is straight forward enough. Democracies are less likely to go to war because politicians want to be reelected. Wars tend to be costly and in today’s world increasingly unpopular and ineffective. It’s much easier for a dictator to push a country into war, and to control any possible critical media outlets. Economic interdependence and membership in international organizations are in many ways flip-sides of the same coin: the more countries interact through trade and treaties, the more they trust each other, and it creates a positive feedback loop. It’s hard to believe, but we are becoming more peaceful as a species. The Trifecta is great, but I’d like to see another factor thrown into the mix: immigration. We readily accept the proposition, “Where goods cross borders, soldiers do not,” but what about an updated and revised version, “Where goods and people cross borders, soldiers do not.” The idea behind the former is that interconnected economies stand far more to lose from a war than any possible gains. As I discussed previously, this has not always prevented war between economic allies, but over time we have seen a clear inverse relationship between interconnected economies and warfare. But what if, in addition to economic catastrophe they would also be attacking a sizable national diaspora living in a potential war zone? Regardless of other factors, would have the U.S. Government been so eager to invade Iraq if it had been well-integrated into the global economy (which it wasn’t) and had had a significant number of American businessmen, students, and families? Further, just as the economy benefits from the free flow of goods and services, would it also not benefit from the free flow of talent and expertise? This can also work in reverse. You only need to look at the disproportionate influence of the Israeli and Cuban immigrants on American policy to see how effective a small minority of immigrants can be in determining foreign policy (though in these cases conflicts seem more likely because of these very vocal communities). I’m sure at this point certain readers have serious qualms with my thesis, and might be quick to point out that when talking about a “national diaspora” I am contradicting my hopes of living in a world free of borders. My rebuttal would be that this transition (which has already begun) will not happen overnight. Even with a Global Passport, most citizens, myself included, would be reluctant to hand over much more than token authority to whichever democratically elected global body was responsible for issuing them. Moreover, this will not work without balancing the equation by creating strong local autonomy to match the broader over-arching authority of international bodies. In short, international organizations can’t fix the world’s pot holes. However, we all know that changes should not come because of society’s benefits, but for individual benefits and freedoms. On an individual level, and from my own experience, I can say that my life is unequivocally better for me than it would have been had I been forced to stay in my hometown or home country. I left the United States in the depths of the Great Recession, when my personal outlook was bleak. In this regard, my story is similar to many other immigrants before me. I left my home in search of better opportunities and steady employment. When I landed in Korea, I found myself in a much better position–financially and socially–than I had been in back home. When I met my future girlfriend, and we proceeded to chase each other around the globe, I was fortunate to be able to start a life with her in Germany without too much red tape. Again, we must continue to come back to how our laws affect individuals. By erecting physical and legal boundaries to immigration, we are succumbing to a 19th century mindset. There is no longer a place in the world for an isolationist nation (look no further than North Korea for proof). Every nation on earth is becoming more diverse, more multi-cultural, more multi-national. Like an advancing glacier, every nation on earth is being subjected to the unstoppable, overpowering forces of globalization. We have the choice to either move or to be crushed under the enormous weight of it all. The nations who are the quickest to adopt to this new paradigm, to allow families freedom of movement and employment, will be the first to benefit from their increased productivity. This was the third part in my “World Without Borders” series on globalization. Part 1, A Pale Blue Dot can be found here, and Part 2, Going Global can be found here.